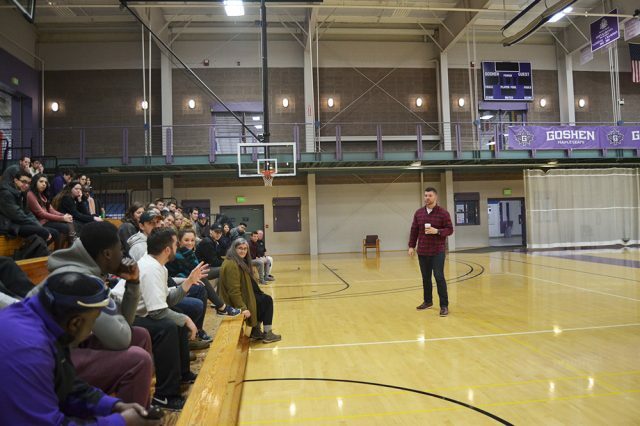 Former local football standout Braxston Cave shared his faith and athletic journeys to Goshen College student-athletes, coaches and community members this past Sunday as part of an event hosted by the GC Fellowship of Christian Athletes campus ministry. Cave began his football career at Penn High School in Mishawaka, Indiana, where he was a Scout.com second-team All-American and a finalist for Indiana’s “Mr. Football” award. Upon graduating in 2007 from Penn, Cave chose to continue his education and playing days at the University of Notre Dame, where he was named a third-team Associated Press All-American in his senior year. Cave then served a brief stint in the NFL for four years with the Cleveland Browns, Detroit Lions, New England Patriots and Washington Redskins before hanging up his cleats to become the Assistant General Manager at Lippert Components in Goshen.